On Sunday, February 3rd, Rabbi Pearl’s Freshman Shiur made a siyum to celebrate the completion of the second, third, and fourth perakim of Maseches Megillah. The talmidim began their busy morning by chazering two dapim of gemara, in order to complete all 15 dapim, spanning the second through fourth perakim. Throughout the previous week, the talmidim had devoted much of their time preparing for a farher on the completed perakim, given by Rabbi Tanchum Cohen. Rabbi Cohen asked several riveting questions requiring the talmidim to think beyond the plain understanding of the gemara. “The bechina covered approximately half the masechta – a sizable amount – and their command and comprehension were quite impressive,” said Rabbi Cohen. “Their excellent performance was a tribute to Rabbi Pearl’s extraordinary skill and dedication and to their commitment, hasmada, and ahavas haTorah.” After the farher, the much-anticipated siyum began. 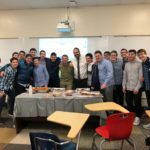 The siyum included a Kahoot competition, which reinforced the knowledge of the Mesechta that the talmidim had mastered, as well as delicious food from Golan. The talmidim truly enjoyed celebrating this incredible milestone together with their rebbe. Click here to view photos.